BINTANGNEWS.com – The Bandung city police have arrested six more Persib Bandung fans for their alleged involvement in the case of Haringga Sirla death. The 23-year-old Jakmania member and Persija supporter, was beaten to death on September 23, 2018. The suspects were identified by their initials A, 21, S, 17, TD, 17, AF, 16, K, 16, and AAP, 15. 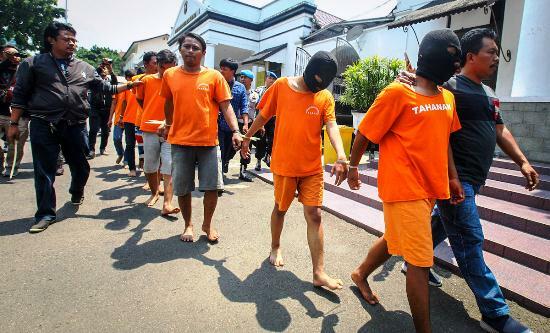 "They are nabbed in different places outside Bandung," Bandung city Police Chief Sen.Coms. Irman Sugema said here on Tuesday. As a result of the arrests of these six suspects, the police have totally detained 14 suspects. Other eight suspects had been nabbed earlier, he said, adding that each of them contributed to the violent acts, like kicking, trampling, and beating, which caused Sirla's death. The detainees would be questioned to find out whether there were still other suspects allegedly involved in Sirla's murder, he said. Haringga Sirla was killed in the courtyard of the Bandung Lautan Api sports stadium in the West Java provincial capital of Bandung on Sunday (September 23). His murder was condemned by various elements of the Indonesian society. Jakarta Governor Anis Baswedan and West Java Governor Ridwan Kamil joined those condemning the murder of this Jakmania member. They have handed over the criminal case to the police. The Indonesian U-16 team conveyed its condolences through a video recording uploaded on the official Instagram page of the team coach, Fakhri Husaini, @coachfakhri, on Monday. "We, a big family of the under-16 national team, mourn the death of the Persija supporter during the Persib-Persija match on Sunday (September 23, 2018)," said the U-16 soccer team's captain David Maulana, who was accompanied by all his teammates, coaches, and staff of the U-16 Indonesia national team.